Please note: if you have the 115V AC power outlet option and want to have full time power there as well, go directly to the full time 115v power mod as it will simultaneously perform both the 115v and 12v power outlet mods. The 2007 Toyota 4Runner comes standard with one front and one cargo area 12V auxiliary power points. Compare this to the 1999 4Runner which came standard with one front mounted 12V cigarette lighter, two front and one cargo area auxiliary power points. Both the auxiliary power points on the 4th gen 4Runner have power only when the ignition key is either in the accessory or the on position. For various reasons a person may want to have power available at these points when the vehicle is off. This modification accomplishes that. 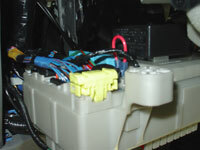 The power outlet relay (DC socket relay) is mounted in the driver side junction box located in the lower finish panel. In the 3rd Gen it's mounted in the engine room relay box and literally is a 5 minute mod, for the 4th Gen allow a little more time. 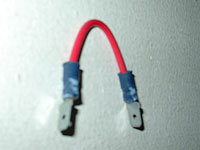 Make a jumper wire by taking a 3 inch piece of 14 gauge wire and crimping on a .250" male solderless terminal to each end. 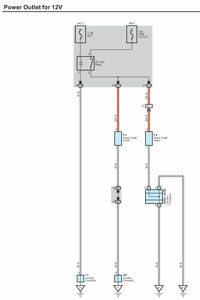 Remove the DC SKT Relay by pulling it straight out firmly. Insert one of the ends of the jumper we just made into the power outlet relay socket #3 and the other end to socket #5. 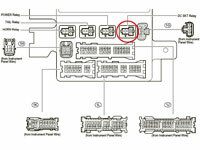 Sockets #3 and #5 are the only places a standard .250" male solderless terminal will fit, so you won't have any trouble identifying where to insert the jumper wire. You will now have 12v power full time to both the front and cargo area 12-volt auxiliary power points. Put everything back together. Now with the key off test that the power points have 12V power. 2 'crimp type' male solderless terminals .250"